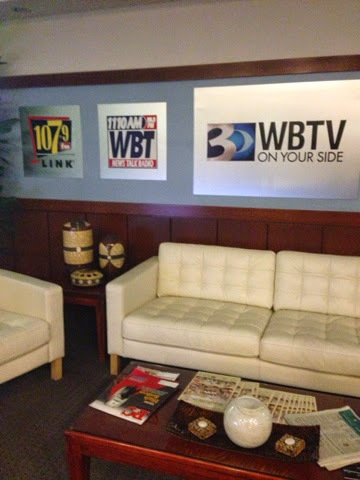 I had an opportunity yesterday morning to take part in a local news segment on our CBS affiliate, WBTV, and present some apple, cheese and beer pairings for the holidays. I was nervous as hayyy-ell. And I tried on approximately sixty-three outfits Saturday night (hated them all), finally deciding on a blouse that I grabbed from my Goodwill pile at our front door. But all in all, it went well and it was a really fun endorphin rush! My Sunday morning started at 5am with a brutal alarm clock ringing in my ear -- I didn't sleep well the night before due to nervousness, a sick baby and a coughing husband. 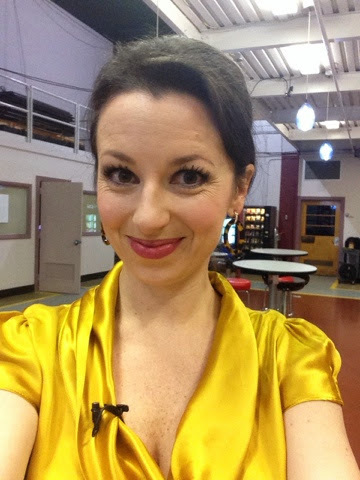 But I got ready for the segment, hopped in my car at 5:45am, and headed to the studio. In the lobby, they had a live broadcast running of the morning news, so I was able to watch the anchors that I would be working with, Brody and Ashley. The security guard took me back to get my mic on, and then I had a little bit of downtime before it was time for me to go get my table laid out. At this point, I still had the jitters, but I was ready to tackle it. For the piece, I chose three cheeses to highlight (Parrano, a 3-year aged gouda, and an aged cheddar). The Parrano was my favorite because it's a nice mix between an aged parmigiano-reggiano and a young gouda. 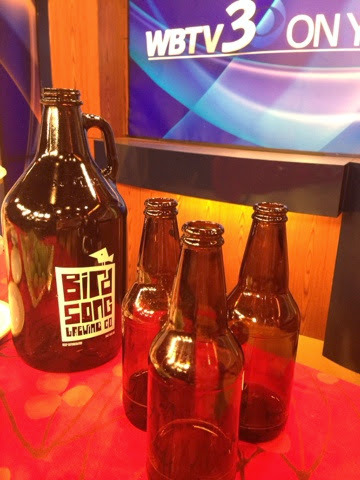 I paired them each with an apple to compliment the cheese and a beer from a local brewery, Birdsong Brewing Company. Their jalapeno ale is my favorite. Brody and Ashley were so nice, and they really helped to keep the conversation going, which made the segment a lot easier on me. It was LIVE so I only had one shot to get it right! Wheat beers: pair the best with goat cheese. The fuller the character in the wheat beer, the more pungent you can go with your goat cheese. Low-hop, milder beers pair well with an aged, nutty Gouda Stouts are known for the bitterness and roasted flavors. Stouts are mellowed by semihard cow's-milk cheese such as aged American Cheddar. Saisons: are bright, citrusy, and slightly tangy. These flavors complement the flavors in a triple cream cheese that are typically smooth, rich and creamy with a hint of sweet grassiness. Cameo apples are believed to be a cross between Red and Golden Delicious apples, since Caudle was growing both varieties nearby at that time. Fuji apples are crisp with a sugary-sweet flavor that resembles that of freshly pressed apple juice. Fuji apples are a cross between two classic American apple varieties - Red Delicious and Virginia Ralls Janet. Fuji apples contain between 15 to 18 percent sugar levels, making them one of the sweetest varieties available. Pair with an aged gouda made with raw milk for a sweet, tangy flavor. Braeburn apples have a robust spicy-sweet flavor with a hint of nutmeg and cinnamon. Pairs well with a spiced gouda with ingredients like pepper, cumin, cloves, nutmeg and cinnamon. Stop it!! How fun is this! You looked darling and you seemed like an old pro! How fun!! Congrats & so happy it went so well for you!! This is SO fun!!! Go you girl!! This is so exciting! YAY friend! You looked great. I didn't know this was apart of your job! Very interesting. Congratulations girl!! that is so exciting!! What a fun segment! And great tips on the pairings!! That's so fun and I love this post bc my husband loves beer, so now I know what kind of cheese to get for his boys nights. From a PR person's perspective you killed it! We schedule lots of these segments for our clients and for a first timer you hit all of your talking points and looked like a natural! What a great plug for your blog! Great job and wonderful suggestions! I have a feeling my hubby would love the jalapeno beer! You looked and sounded like a pro!! So awesome, congrats!! What a cute segment! Congrats on your TV debut. Wow! Congratulations, that is so exciting! Oh my goodness, how cute are you?! What an exciting venture... you looked like a natural on air. Congrats! What an exciting morning! And a great way to start off some day drinking. We are having apple and cheese paninis Wed night, I may have to try one of your suggestions - I'll have to figure out the best pairing for O'Douls. You were GREAT!!!! Good job! 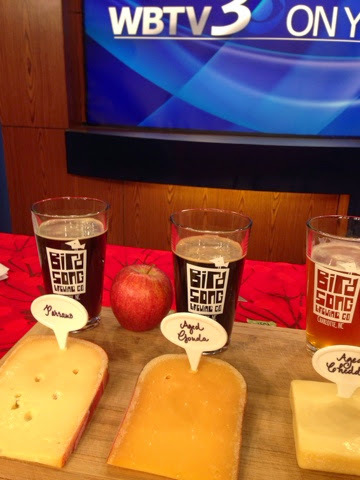 And the beer, cheese, and apple pairings sound delish! 16 more weeks of pregnancy, and I'm trying them out! You were so great. I did a similar thing on Fox 46 Carolinas this weekend and I was sooooo nervous. I woke up at 4:15, 45 minutes before my alarm was set, because I couldn't sleep. I love your pairing suggestions! What an awesome, awesome experience! Congrats girl! You seemed so comfortable! Such a natural! Congratulations!! So fun! I would be a nervous wreck!! So great! I don't know you but I've been following your blog for awhile so feel I do! Ha! You did so amazing April, I really admire your confidence, poise & elegant approach. You are a super star. What a fun experience!! You did great!! You did such a great job! Wow! Just a regular local tv celebrity, NBD. Love it! TRAGIC, haha! Sadly the blouse needs to go to Goodwill. Have you thought about elocution lessons? You should. GOMI and go find Bill W.
PROUD OF YOU --- what a neat opportunity!! Hope you guys are having a wonderful Thanksgiving! XO. You were PERFECT!!! Love this guide--pinning for my beer lover, Bryce! Great job! You looked adorable! 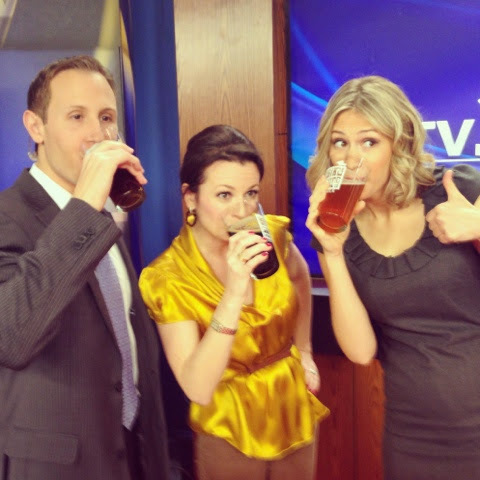 Love the pairings you suggested... maybe do a follow up story using ciders? Puh-leeze!? You did a wonderful job!